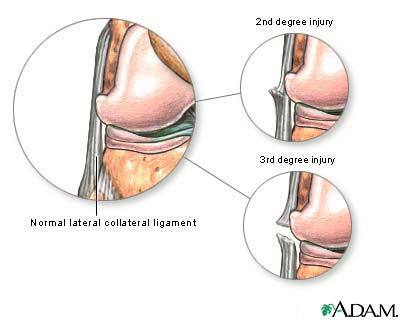 A second degree injury is a partial tear with no firm endpoint when the joint is stressed, and a third degree is a complete tear of the ligament. A physical examination will be done to test the extent of damage. Some other tests may include an MRI or joint X-ray. Updated by: C. Benjamin Ma, MD, Assistant Professor, Chief, Sports Medicine and Shoulder Service, UCSF Department of Orthopaedic Surgery. Also reviewed by David Zieve, MD, MHA, Medical Director, A.D.A.M. Health Solutions, Ebix, Inc.